This paper attempts a difficult task: quantifying the relative influence of Yayoi agriculturalists and Jomon hunter gatherers on the population of Japan. While relatives to the early farmers of Japan can be traced to Korea or China, there are no known relatives of the Jomon people. This is different from the case of Latin Americans, where Amerindians have been largely absorbed in the Mestizo population, but populations with minimal European or African admixture persist. It is also different from the case of Indians, where the Ancestral South Indians have also been largely absorbed but their distant relatives in the Andaman Islands still exist. This is an issue that will come up time and again: in Europe, for example, the hunter-gatherers disappeared thousands of years ago, and the extant population is apparently a mix of the two in proportions that remain to be determined. And, there were probably older, pre-Neolithic, episodes of admixture, as well, when different groups of modern humans expanded across the globa and mixed with older groups of modern humans, or, as it seems increasingly likely, with archaic humans as well. It is sometimes possible to obtain ancient DNA from pre-contact individuals and determine their contribution to modern populations directly. However, there is still value in trying to extract this signal in the absence of ancient DNA, as was attempted for archaic Africans, and, in the current paper for the pre-agricultural Japanese. Hopefully, the latter can be eventually studied directly, and their genetic makeup can then be compared with their reconstruction in this paper. The authors link the Jomon to modern Altaic populations of Siberia. There has already been ancient mtDNA work on the Jomon tying them to Siberia. On the other hand, the link to Altaic populations is intriguing, and I am wondering whether the authors' model (which uses Chinese and Koreans as farmer representatives) may not be actually representing as a substratum of the farmers, what may in fact be -at least partially- an Altaic superstratum. The genetic origins of Japanese populations have been controversial. Upper Paleolithic Japanese, i.e. Jomon, developed independently in Japanese islands for more than 10,000 years until the isolation was ended with the influxes of continental immigrants about 2,000 years ago. However, the knowledge of origin of Jomon and its contribution to the genetic pool of contemporary Japanese is still limited, albeit the extensive studies using mtDNA and Y chromosomes. 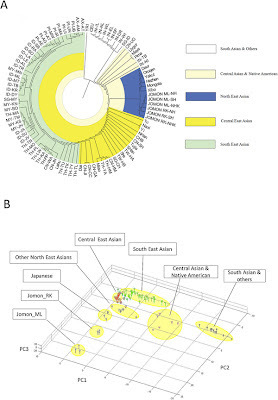 In this report, we aimed to infer the origin of Jomon and to estimate its contribution to Japanese by fitting an admixture model with missing data from Jomon to a genome-wide data from 94 worldwide populations. Our results showed that the genetic contributions of Jomon, the Paleolithic contingent in Japanese, are 54.3∼62.3% in Ryukyuans and 23.1∼39.5% in mainland Japanese, respectively. Utilizing inferred allele frequencies of the Jomon population, we further showed the Paleolithic contingent in Japanese had a Northeast Asia origin. The Ainu are widely considered to be the population successor to the Jomon. "It is also different from the case of Indians, where the Ancestral South Indians have also been largely absorbed but their distant relatives in the Andaman Islands still exist". I'll grant that your comment was really an aside but there is another explanation here. Your comment would only hold true if the Andaman population is representative of the original 'great southern coastal migration'. But that is actually unlikely to be the case. They are probably much more recent arrivals in which case the connection is with a minority of the current Indian population. In fact your 'Copernican' Reassessment of the Human Mitochondrial DNA Tree' gives the ages of the relevant mt-DNA haplogroups as M31a1: 5900 years, and M32a: 7452 years. This strongly supports the idea that the Andaman population is not some relict population but a relatively modern one. Interesting that in these tree studies, it always appears that Native American and NE Asian populations split off first (from Indian populations etc.). I asked this before: wouldn't this contradict a coastal migration for NE Asians, and be more in line with one either west of the Himalayas, or perhaps Myanmar/adjacent China? They are actually not pure Jomon, see link on ancient mtDNA work on Jomon. Not pure, but likely to be a better hint than any other extant population. Likewise, the absence of Hokkaido population is disappointing. "I asked this before: wouldn't this contradict a coastal migration for NE Asians, and be more in line with one either west of the Himalayas, or perhaps Myanmar/adjacent China?" I have never been even slightly convinced by any arguments in favour of the Great Southern Coastal Migration since it was first proposed. My comment above regarding the Anadamans is just one piece of evidence against. I remain convinced that Y-DNA C and mt-DNA N moved east to the north of the Himalayas (even north of Tibet) and were later forced south, or locally exterminated, by the intensifying ice age. And even M's move east (presumably through South Asia) looks very unlikely to have been in any way 'coastal'. Its greatest diversity is in the hill country on the Northeast India/Yunnan border region (presumably including Northern Burma). Its arrival in that region can in no way be considered coastal. According to the PCA plot, there is a relatively huge genetic distance between the "Jomon" inferred based on Japanese mainlanders and the "Jomon" inferred based on Ryukyuans. If the authors' main conclusions are correct in their broad outlines, then I think we are dealing with two very different "Jomon"s (I don't know how accurate it is to call them with the same name). That Japanese derive "equally" from both Koreans and Chinese is a purely political, not scientific, construct that has been debunked countless times. It has very little currency outside the Chinese and Japanese "scientists". The Japanese do not derive from either of those groups. There is a fairly good consensus within the linguistic community that the Yayoi immigrants to Japan spoke a variant of proto-Japonic, which had co-existed with proto-Koreanic on the Korean peninsula, but was not derived from it - re: Vovin, Janhunen, Unger, etc. The nationalistic side to this question has to do with the historical ethnology of the Korean peninsula. For adherents of the orthodox view, every kingdom on the Korean peninsula was, ex post facto, ethnic Korean. But then the only narrative possible is that Koreans became Japanese upon migrating to Japan. Quite problematic for linguists, as the Japanese were speaking a different language before the migration began. Lathdrinor appears to mightily confuse genetics and linguistics. The question originally was whether the immigrant component of the Japanese population largely derives from the (ancient) populations in the present day Korea and southern Manchuria or from China proper(traditional Han Chinese territories). That some in Korea possibly spoke a Japonic language does not mean that they were Japanese or closely related to them any more than black Jamaicans descend from Alfred the Great. "That Japanese derive "equally" from both Koreans and Chinese is a purely political, not scientific, construct that has been debunked countless times." I don't think I was the one initially confusing the two. *Korean* and *Chinese* are ethnic, cultural, political, and linguistic identities. Saying that the Japanese were derived from them - as you did - is akin to saying that the French were derived from the Germans. "That some in Korea possibly spoke a Japonic language does not mean that they were Japanese or closely related to them any more than black Jamaicans descend from Alfred the Great." It does not mean they were Japanese, but neither does it mean they were Korean. That's the political catch 22. As for whether they were closely related to the Japanese - that has to wait for proper studies of said population. Lathdrinor is also guilty of being uninformed. Both Vovin and Unger think that all three Korean kingdoms, Koguryo in particular, spoke Old Korean or a language closely related to it. The person he wanted to quote was Christopher Beckwith, a non-linguist, who has many wacky ideas among which discrediting Sino-Tibetan language family figures prominently. Other than that I think Lathdrinor is suffering from the lack of familiarity with the English language. "Koreans" cannot be a language. Look at the case(plural). On the other hand Korean as a noun usually refers to the language if it is not accompanied by an indefinite article. I don't know where I offended his "pro-Japanese anti-Korean" sensibility but I don't care. I think what I meant was quite clear to most readers from the context. Even under the best of the scenarios Japanese cannot be the close relatives of those who spoke Japonic in ancient Korea. The degree of hybridization with the Japanese aboriginals was too massive as indicated by this paper. No need to shed your tears over the imaginary relatives of Japanese in ancient Korea who perished despite being noble(supposedly) and rightful owners (supposedly) of that land. It is all in your head and only in your head. "Lathdrinor is also guilty of being uninformed. Both Vovin and Unger think that all three Korean kingdoms, Koguryo in particular, spoke Old Korean or a language closely related to it." I don't remember either Unger or Vovin saying that the populations of these kingdoms all spoke Old Korean; as for a language closely related to it, Old Japonic fits the bill, though for Unger related means genetically related, whereas for Vovin related, as of 2010, means areally related. "The person he wanted to quote was Christopher Beckwith, a non-linguist, who has many wacky ideas among which discrediting Sino-Tibetan language family figures prominently." You call me uninformed, and then state that Beckwith is a non-linguist? Hilarious. Bringing up Beckwith just to insult him does, however, reveal a strain of personal insecurity on your side. "I don't know where I offended his "pro-Japanese anti-Korean" sensibility but I don't care. I think what I meant was quite clear to most readers from the context." *Koreans* refer to an ethno-national group which subsumes, among other things, linguistic identity. Were you politically indifferent to the distinction between Koreans and populations in the Korean peninsula and southern Manchuria, you would not have moved to attack my comment. Your response was, I'm afraid to tell you, all too typical of Korean nationalists, complete with these offhand comments about me being pro-Japanese and anti-Korean. "Even under the best of the scenarios Japanese cannot be the close relatives of those who spoke Japonic in ancient Korea. The degree of hybridization with the Japanese aboriginals was too massive as indicated by this paper." That depends on how different the Japanese aboriginals were from the Yayoi in the first place. After all, Koreans and Japanese are described as close relatives, yet logic dictates that the Japanese have to be closer to their Japonic speaking ancestors than they are to modern day Koreans as a whole. I don't see what's so hard about this. Lathdrinor... I doubt you have read any of the literatures by Vovin, Unger, Bechwith etc. "Genetic relation of languages" is a well defined basic terminology in linguistics. LOL. "related" in linguistics by default means this. If you think Vovin uses it to mean something else you don't even deserve to discuss this topic. Beckwith is not a linguist because other linguists do not think he is. A lot is known about the Japanese aboriginals before Yayoi already. They were most certainly quite different from mainlanders, both genetically and phenotypically. "Japanese have to be closer to their Japonic speaking ancestors than they are to modern day Koreans as a whole"
But those Japonic speaking ancestors most probably were not closer to modern day Japanese than to modern day Koreans. I am not inclined to provide "evidences" on things most readers of this blog know already. Until you actually read some of the literatures on this topic(for instance "Korea-Japonica: A re evalution..." by A Vovin) I will ignore your comments from now on. ""Genetic relation of languages" is a well defined basic terminology in linguistics. LOL. "related" in linguistics by default means this. If you think Vovin uses it to mean something else you don't even deserve to discuss this topic." That Japanese and Korean are related areally is one of Vovin's explicit statements in his 2010 book. And again, neither Unger nor Vovin have went on the record to say that the populations of the Korean peninsula were all Koreanic speaking prior to the period of linguistic unification circa 3rd-7th centuries AD. "Beckwith is not a linguist because other linguists do not think he is." Which is why linguists such as Whitman, Robbeets, and Irwin cite his linguistic work in their papers and books. Right. Beckwith is a polarizing figure, and but he is far from being a non-linguist. By slandering his academic training, you have demonstrated nothing less than willful ignorance. "But those Japonic speaking ancestors most probably were not closer to modern day Japanese than to modern day Koreans." Which is not what was argued. But on that topic - modern day Koreans aren't descended strictly from Koreanic speakers. They are a mix of ancient Koreanic, Japonic, and other language speakers. The contention is not that modern Koreans aren't related to both the Koreanic and Japonic speakers that once populated the peninsula, but that the Japanese were not derived from the Koreans. For all their differences, this is one area where Unger, Vovin, Beckwith, Janhunen, and Whitman agree - the main component of the Yayoi migrants to Japan were Japonic speakers, not Koreanic speakers. Korea was once the homeland of both groups. "I am not inclined to provide "evidences" on things most readers of this blog know already." Please. From what I see, you are not inclined to provide any evidence - ever. You are better at setting up strawmans and redirections than you are at compelling rhetoric. There were no "Japonic" speakers in the Korean peninsula. The Japanese language has links with the Baekje language, which was Koreanic. Japonic languages are Japanese and Ryukyuan/Okinawan. They are derived from a common root and that's mainly from the intermixing of the Yayoi invaders and Jomon Aboriginies. Korean tribes were mainly derived from the Gojoseon. This is the state which Buyeo and Silla derived from. Remember there was a lot of intermixing between Koguryo (present-day central, east and north), Baekje (southwest) and Silla (east/southeast) in these periods and they were most certainly genetically the same. Japonic languages aren't totally derived from Koreanic languages. But many linguists do suggest a Japanese-Baekje (Southwest Korean) link. This study actually found that Japanese are more derived from Southern Han Chinese, which contradicts many Korean nationalists who think Japanese are basically Koreans who moved to an island. Also, the Aboriginal Jomon were most likely genetically very different from mainland Yayoi. Many studies suggest Japanese have more Australoid/ASI elements which are lacking among most Northern Han Chinese and Koreans. "Link" is a pretty wide-ranging term, Justin; are you suggesting a genealogical link or an areal one? I would also have to agree with Dienekes on this one. This study is flawed in that they aren't using pure Jomon populations to begin with (the purest you can get are the Ryukyuan/Okinawans). Then after that they use a genetic hybrid model, such as Jomon-NHK, Jomon-NH, Jomon-SH. Thus their conclusion that the Jomon have a Northeast Asian origin is full of errors and skewed by their hypothetical hybrid models. I would suspect the NHK (Northern Han/Korean) hybrid would be tied to Northeast Asians/Altaic populations. This could have skewed the results since they did not even have a pure Jomon sample in their analysis. We all know that Koreans are relatively closer, genetically, to their historical neighbors (Manchurians/Mongolians) than both Han and Japanese when it comes to raw FST or IBS values. Furthermore, if their hypothetical Jomon-NHK hybrid population is within the Altaic genetic branch, then it would most likely follow that Jomon-NH and Jomon-SH would be in the same branch. Does anyone see the massive flaw in this study? I think this study's results are too inaccurate and flawed to even be making a conclusion. Too many assumptions and the methodology is very vague. Also, what explains the Papuan/ASI component among Japanese which keeps coming up in some ADMIXTURE runs? It has to be the Jomon component as this component is not found in northern East Asia. Another study on the HUGO samples found the Japanese to be particularly close to some Indian/South Asian samples. Also some Japanese shift more towards Thais. On average, the Japanese samples are closer to South Asian populations compared to Northern Han and Koreans. Justin - as I said, there is a wide consensus among comparative linguists that there were Japonic speakers on the Korean peninsula, and that these are the primary component of the Yayoi. You are free to browse the literature from Unger, Vovin, Janhunen, Beckwith, Whitman, and their peers for an assessment of the present opinion among academics in this area. Next to no linguist today thinks that the Japonic languages were derived from the Koreanic languages in historical times due to the large lexical differences between the two. Again the Baekje language was NOT a Japonic language. Please re-learn language classifications. There is absolutely no evidence that a Japonic language existed on the Korean peninsula. The only Japonic languages are Japanese and Ryukyuan/Okinawan. The Buyeo and Silla languages were NOT Japonic. They were both Koreanic. The Japonic language is clearly different from any Koreanic languages, but closest to the Baekje (Southwest Koreanic) language. By the way the Buyeo language was most certainly similar, or if not, the same. Both these states existed before a Japonic language even existed. There is no evidence of the existence of a Japonic language in the Korean peninsula. There are also little to no written records of how the Baekje language was structured, thus conclusions are impossible to make whether it influenced the Japonic languages or not. Some linguists have hypothesized that Japanese is a part of the Baekje language family (a Koreanic language), however that is nearly impossible to prove since there is not enough evidence. But linguists certainly do not classify any language which existed in Korea as Japonic. I highly suggest you re-learn the classifications of Koreanic languages. The Japonic languages evolved independently. Next time please directly quote peer-reviewed literature. And don't re-interpret things your own way since that leads to bias. I want objective evidence. Justin, I've cited my sources several times, whereas you've cited none. I think the burden of proof is on you, not on me. You can deny that Japonic ever existed on he Korean peninsula, but your disagreement is with the top comparative linguists in the world, not with me. Everything I've cited is peer-reviewed. The idea that the Japonic languages came into being during the Three Kingdoms period of Korea is not supported by time depth analysis - refer to publications by Vovin, Unger, Janhunen, Whitman, and Starostin for details. My sources are Vovin, Unger, Beckwith, Janhunen, Whitman and Starostin. None of them support your crazy theory that a Japonic language existed in Korea. Some of them have hypothesized a Baekje-Japanese linguistic connection. The Buyeo language came from the Gojoseon language. Gojoseon existed even before the Yayoi period. So you're basically saying that the Gojoseon language was Japonic. Please research linguistic classifications before humiliating yourself. The Japanese language is Japonic. The Japonic language has only ever included Old Japanese, Middle Japanese, modern Japanese and Ryukyuan/Okinawan. Most linguists agree that they were mutually intelligible, which means that they certainly belonged to the same language family (i.e. Koreanic). There were sub-families, however none of them were Japonic. I suggest you look back on Vovin, Unger, Beckwith, Janhunen, Whitman and Starostin. These are sources I've used too. Care to quote them on saying that there was a Japonic language that existed in Korea? What was this language called? "A form of [Japanese] was no doubt spoken on the peninsula. For the time being, I prefer to think of Koguryoan, Paekchean, and Sillan as three early varieties of Korean that displaced residual Chinese and para-Japonic speech in a north-to-south advance ... Thinking of Korean as a successful intruder rather than as a survivor in situ from neolithic times should make it easier to investigate that question and to understand how Japanese got to its present range." "From the standpoint of this paper, the important takeaway lesson from the Koguryo toponymic data is that a language cognate to Japonic was spoekn on the Korean peninsula. This is a point of consensus for all major scholars who have worked on this material." "The existence of a Japonic language spoken in the past on the Korean peninsula is an undeniable fact, [though] in all probability the existence of this language predates the state of Koguryo." "During the Three Kingdoms period at least two different language families were simultaneously present on the Korean peninsula: Koreanic and Japanic. Koreanic consists at least of Shilla, whether or not the immediate ancestor of MK, and Han-Paekche. ... Japanic consists at least of Japanese-Ryukyu and of Koguryo, that is more closely connected to Japanese than to any other language." These are sources from pseudo-linguists. The Japonic language family was derived from a language in Korea. It's obvious. However it's incorrect to say that Japonic was spoken in Korea. It was Koreanic, not Japonic since by definition Japonic only includes Old Japanese, Middle Japanese, modern Japanese and Ryukyuan/Okinawan. Probably proto-Japonic would be a better term. However there is no evidence whether proto-Japonic languages were spoken in Korea. These are just theories, not facts backed up by evidence. Furthermore the Baekje language was nearly identical to the Koguryo language. Southwest Korea is much nearer to Japan than northern Korea. Recent genetic studies suggest that Japanese are genetically closest to Jeju and Jeolla Koreans. These are Koreans living in the southwest of Korea, which means a Japanese-Baekje relationship is more realistic. Central Koreans (former Koguryo territory) are genetically closer to eachother and Gyeongsang Koreans (former Silla territory) but not Japanese, meaning Japanese have little to nothing to do with the northern Korean kingdom of Koguryo. Recent genetic studies prove that genetics are related to geographical distance. Japan is south of Korea and thus the Yayoi most likely came from south of Korea to Japan. It is highly unlikely that Koguryoans (who were located in present day central and northern Korea) would have sailed such a far distance towards Japan. It is much more logical that Baekje people or Silla people sailed to Japan, however genetic evidence suggests southwest Koreans (former Baekje territory) and Japanese are more closely related. Japanese are 20-60% Jomon depending on what area they come from. Ryukyuans/Okinawans and most certainly the Ainu have the most Jomon genetic markers. It's interesting how modern genetic can often disprove some earlier linguistic hypotheses. However it's obvious a language related to Japonic was spoken in Korea, however it was most likely spoken in the southwest (possibly a dialect of the Baekje language). Whether it is classified as Koreanic, proto-Japonic or Japonic is debateable since there is no conclusove evidence due to the lack of records of ancient Koreanic languages, except for some cognates. Japanese people are a mixed ethnic group of southwest Koreanic or proto-Japonic speaking invaders, southeastern Chinese and various Jomon tribes. Their Y-haplogroup markers are very diverse, the main ones being O2b, O3 and D2. Remember the Jomon are early archaic humans who resembled Australoids. I'm assuming that's where the South Asian or Papuan admixture among Japanese samples come from. Lathdrinor, no more deceitful qoutes please. Manchu and Jurchen languages' being "so non-Tungusic" according to Vovin has nothing to do with Japonic. In fact it is his central thesis that the Jurchen-Manchu language has many Koreanic loan words while other Tungusic languages don't. When coupled with the fact no Japonic looking loan words exist in their language it strongly suggests that the language of Koguryo and Parhae(Fuyu) was Koreanic because most of these Korean-looking loans are incompatible with their derivation from Middle Korean or Old Korean-Silla dialect. In other words they must derive from a genetically closely related language to Silla Old Korean but not identical to it. Read Vovin's work for further details. In fact he goes on to say that the distinct features of the Jurchen language come not only from Mongolian via Khitan but also from a Koreanic language probably spoken by Koguryo and Parhae elites. I am not thoroughly convinced by Vovin on Koguryo's language being Old Korean but his excellent work proved that it was not Japonic. That is pretty clear. A people who held such a hegemony in that area for such a long time should have left some linguistic legacy. And it ain't Japonic. I am not accusing Lathdrinor of being Chinese but he is clearly sympathetic to their agenda and I don't understand his antipathy toward Koreans. Not complaining though. It is fun to have weak enemies. This is not a double post. I have not seen Justin's post when I wrote mine. First of all, a correction. Parhae in Chinese is probably Bohai not Fuyu which I believe is Puyo in Korean. Justin does not seem to know much about linguistics. In that regard he is no different from Lathdrinor. However the latter is at least willing to read while Justin seems so confident about his stance and what he thinks he knows. You cannot prove or disprove linguistic theories with genetics. At best genetics can be very weak supporting *CIRCUMSTANTIAL* evidences. Many linguists dispute even this. There is no need to quibble over what is Japonic and what is not. The proposed Koguryonic as a Japonic language places it as a cousin to the current bunch of Japonic languages. I don't buy it though for reasons I stated in the above. No one disputes that there were non Koreanic languages spoken on the Korean peninsula at one time. Even those accepting Korean and Japanese as sister languages place their separation at 4000 yrs or older. Much much farther back than Yayoi immigration. In other words the Yayoi were already speaking Old Japanese or a language immediately ancestral to it when they left Korea. Naturally most including Vovin believe that Japonic languages existed in ancient Korea. Also no one disputes that the Japonic looking toponyms in central Korea represent such languages. It is just that ,as Vovin says, they are most likely "pseudo-Koguryonic", not the real language spoken by Koguryo people, especially their elites, by the time Three Kingdoms consolidated during the 4th century. It is very little known a fact that Koguryo elites and royalty regarded themselves as "Three Han". Koguryo royalty and top elites taken to Tang China left inscriptions on their tombstones to that effect. Things like describing themselves as Yodong(Liatung) Three Han, nobility of Three Han etc etc. Koguryo was more Korean than most people give them credit for. @Hector "Lathdrinor, no more deceitful qoutes please. Manchu and Jurchen languages' being "so non-Tungusic" according to Vovin has nothing to do with Japonic." "The existence of a Japonic language spoken in the past on the Korean peninsula is an *undeniable fact*." Your entire post is an off-topic diatribe about that single article, yet none of it disputes what I said. Vovin believes that Japonic was spoken on the Korean peninsula, as does - in Whitman's words - "all major scholars who have studied this material." Whether Koguryo in particular was Japonic is not and has never been my contention, though obviously you have sufficient emotional stake in the matter to slam Beckwith for arguing it when I didn't bring it up. @Justin "These are sources from pseudo-linguists." This is the most amusing line I've yet read in this entire discussion. Vovin, Unger, Janhunen, Beckwith, Robbeets, Whitman, and Sagart are pseudo-linguists? The funniest part is that you claimed they were *your* sources, too, right before I brought up the quotes and you read them. So, academic credentials are based on whether you like what's being said? Typical. "However there is no evidence whether proto-Japonic languages were spoken in Korea. These are just theories, not facts backed up by evidence." Theories are based on evidence, and in this matter there is widespread agreement between linguists that the evidence support Japonic languages being spoken in Korea before linguistic unification in the peninsula eliminated it, and that it was these speakers who brought the Japonic languages to Japan, and who thereby formed the Japanese people. Of course, this does not make the Japanese pure and it does not make them unrelated to Koreans. But the Japanese are not derived from the Koreans. I just read Lathdrinor's last post. His emotional outburst is quite amusing. He seems willing to accept most theories by linguists, yet he goes on to equate ethnicity and language, which will quickly earn universal scorn among linguists. For him Americans of Jamaican descent did not derive from Africans because they were already English speaking when they immigrated to the US. Not only that he "naturally" assumes that they are closer, genetically, to other English speakers than to Swahilis. Also he must think that Normans of England were not of Scandinavian descent because they were already French-speaking when they invaded England. When a group immigrates to some other place it is bound that they come from a certain backgroud, a certain region. To make a hair-splitting distinction to claim A did not derive from B says more about his emotional hang-ups than anything else. Genetic evidence is far more convincing than linguistics. What these linguists have proposed years ago do not fit in with recent genetic evidence, which is far more reliable and conclusive on genetic relationships. The only linguistic data available from the ancient Koreanic kingdoms are cognates, which means proper relationships between them and Japonic can not be established. Genetics is a science and an accurate one. It is not possible that Koguryo people migrated to Japan since there is genetic evidence saying that modern central Koreans (where Koguryo population was largely concentrated) are unrelated to Japanese. The Southwest (Baekje) Koreans are the most related to Japanese according to recent genetic studies. Again, Japonic languages were not spoken in Korea. Japonic languages only include Old Japanese, Middle Japanese, modern Japanese and Ryukyuan/Okinawan. Please use logic next time. It is most likely that a proto-Japonic language (probably a dialect of Baekje) was spoken in Southwest Korea before this population migrated to Japan. It fits genetic evidence and the Baekje language was most similar to Koguryo. It's almost certain that the proto-Japonic speakers that migrated to Japan were genetically most similar to present day Southwest Koreans. However the populations of Koguryo, Baekje and Silla were all genetically related. All three peoples came from the ancient Korean kingdom of Gojoseon. Therefore labelling any of them as "Japonic" is incorrect since there was no Japonic languages prior to the migration event from Southwest Korea to Japan. Again proto-Japonic was most likely a dialect of Baekje. I think it's obvious Japanese are not derived from Koreans. Japanese are typically shorter, have a mixture of Sundadonty and Sinodonty and have the paleolithic arcahic Jomon genetic component. @Hector your examples are silly. African is not an ethnicity, and neither is Scandinavian. Jamaicans do not subscribe to an African ethnic identity - that is a construct of the host country. In America there is no distinction between a Tutsi and a Hutu, yet to say that Tutsi immigrants and Hutu immigrants fleeing war-ravaged Rwanda are of the same ethnicity is to spit in the face of truth. Historians do not all agree on the usefulness of ethnicity as a concept in pre-modern history, but for those that do, language is a basic component of ethnicity, which is ultimately a matter of self-identity. The two are not independent of each other. Without mutual linguistic intelligibility, co-identification between groups is difficult to achieve. Thus, it is oft said that the development of an unified lingua franca within a polity is a critical stage of ethnogenesis. Of course, that is not to say that linguistic uniformity is necessary and sufficient for ethnic co-identity. But for groups that spoke mutually unintelligible languages - as Japonic and Koreanic were - and which lived in a politically variegated environment - as the Korean peninsula was prior to the 7th century - the burden of proof is on the arguer that they shared a common ethnic identity. The linguistic ancestors of the Japanese left the Korean peninsula before the period of linguistic and political unification - by what do we say, then, that they were ethnically the same as the linguistic ancestors of the Koreans who displaced them? Brushing aside the opposing argument as just "silly" is a sure sign that you don't really know much about the subject. So did Gauls adopt Latin or did people of Roman descent replace them in what is now France? And what makes you think that it was not a mere language replacement process by which the para-Japonic speakers came to speak Korean instead? The "burden of proof" stuff is a cowardly way of saying you don't really have the "argument". I have been very lenient with you. Most scholars, at least those who know something about linguistics, would have dismissed you out of hand as soon as they saw you equating language and genetics. P.S. Gardiners and several others noted from textual analysis that in ancient Korea "us" and "others" were divided along being Chinese and native. It is their words, not mine. It is only your fantasy that the linguistic ancestors of Japanese in Korea had such a keen sense of self identity different from the rest; to sequester themselves from the disgusting Koreans until ,alas, the fate forced them to be replaced... but not before they proudly sired their legitimate heirs in the islands southeast to their homeland... blah blah. As I said it is fun to have weak enemies but now it reached a point where I feel like I am beating up on a quadriplegic missing all his teeth. It's hilarious how Lathdrinor thinks that somehow there were a secret unknown Japanese tribe living in Korea before they all started to move to Japan. Maybe in fictional stories, but come on, please use some logic. If there were proto-Japonic people in Korea, they certainly were quite close to neighboring groups. That's why it's useless to argue whether they were proto-Japonic or Koreanic because they were likely to be genetically similar to their neighboring populations (Southwest Koreanic groups). Proto-Japonic people were related to continental East Asians (Koreans and there is some evidence of a Southeastern Chinese genetic contribution). However when they settled in Japan and intermingled with the local Jomon they became a heterogeneous population. Through intermixing for many generations they formed the modern Japanese population. That's why some Japanese look more Australoid. "So did Gauls adopt Latin or did people of Roman descent replace them in what is now France?" Your examples and analogies are horrible, which is why they are silly. Giving more of them does not help your case. Did the Gauls adopt Latin? Yes. Did the Japonic speakers in Korea adopt Koreanic? Yes. What does that have to do with the ethnic identity of the people who left Korea before this happened? The proper question to ask is: were the Gauls Latinites because their descendants adopted Latin? The answer is obvious. "And what makes you think that it was not a mere language replacement process by which the para-Japonic speakers came to speak Korean instead?" "I have been very lenient with you. Most scholars, at least those who know something about linguistics, would have dismissed you out of hand as soon as they saw you equating language and genetics." First, I did not equate language and genetics. Second, even if I did, I very much doubt that linguists and geneticists would dismiss a relationship between language and genetics. Equating them is an extreme position; interrelating them is a mainstream position. "P.S. Gardiners and several others noted from textual analysis that in ancient Korea "us" and "others" were divided along being Chinese and native. It is their words, not mine." Gardiners was referring to the period of Han Dynasty rule in northern Korea, which lasted a few centuries. There were no Chinese in Korea for the vast majority of its history. The idea that identities in the Korean peninsula have always been defined along Chinese versus native is ludicrous. You are misrepresenting Gardiners' argument. "It is only your fantasy that the linguistic ancestors of Japanese in Korea had such a keen sense of self identity different from the rest; to sequester themselves from the disgusting Koreans until ,alas, the fate forced them to be replaced... but not before they proudly sired their legitimate heirs in the islands southeast to their homeland... blah blah." My "fantasy" of a multi-ethnic, multi-lingual, and multi-cultural Korean peninsula is shared by others - such as Gina L. Barnes, Sarah M. Nelson, Juha Janhunen, and an increasing set of scholars studying Korean history now that the ice has been broken. You have a population of people whose primary language, Japonic, was intrusive to the Japanese islands. You have evidence that this population moved to the Japanese islands from the Korean peninsula. You have evidence that the language they spoke was mutually unintelligible with Koreanic, and was not derived from it. You have evidence that the migrant descendants of said speakers did not identify themselves as migrant Koreans. You have evidence that the descendants of said speakers on the Korean peninsula were linguistically and ethnically absorbed by Koreanic states. My scenario logically follows. But of course, you are free to disagree. I will not stoop myself to your level by the dispensing of childish insults. But having said that, your fantasy of abuse by revanchist Japanese nationalists bent on ridding themselves of relations with disgusting Koreans is just that - a complete fantasy. Saying that the Japanese were not derived from the Koreans does not obviate relations between them. I was just going to gleefully ignore Lathdrinor but just could not resist. This "argument" if it can be undeservingly glorified as that, started from the view point of genetics. Look at the title. It is Lathdrinor who made any reference to languages to begin with. So if Japonic speakers came to adopt Korean what makes him think that Japonic itself was not initially imposed upon or adopted by them? There are no archaeological nor textual evidences that support multiethnic ancient Korea other than some Chinese or Sinitic speaking communities here and there. (Oh they were there before Han commandaries) Even there it is not really clear whether they represent a different ethnicity. As Ireland became Anglicized in the 19th C. some were speaking Celtic and others, English. Were they of different ethnicities? Also Yayoi was just one type among many that migrated to Japan. It just became dominant by some degree of numerical superiority and with a lot of luck too. Mumun(no pattern pottery) and other types, not from trade nor cultural exchange, appear among artifacts too. Things like dolmen are unmistakable signs as they cannot be traded or adopted;burial practices are very conservative. If you are capable of understanding this argument this is more damning to your corny crusade against Korean nationalists than anything else is. With a slight accidental twist of history Japan could have been Koreanic,gilliak or tungusic speaking now(as a matter fact Koreans could have been any of the above too including Japonic), as complex as the lingustic landscape of Korea once was. That Lathdrinor is a novice both in linguistics and genetics is pretty obvious. Most of his "knowledge" in this area is just a few weeks old. He will just have to accept it as hurtful as it may be that the second colonization of Japan was from Korea, not China. And I get the feeling that as he reads more and more of Vovin he will begin to hate Vovin. Thank Vovin for making a case for Japanese and Korean as Sprachbund but that is as far as Lathdrinor will like him. According to Vovin certain Korean loan words appear in Old Western Japanese because "Japan was a country founded by Koreans". Oh yeah I forgot to mention how massive was the Korean immigration (Korean speaking bona fide Koreans in any sense of that word) during and right after the Three Kingdom period. But you know... I am not that cruel. I think Lathdrinor doesn't know much about genetics. Yayoi (the proto-Japonic speaking population) were from Korea and were related to neighboring Koreanic groups, especially the Southwest Koreanic groups (Baekje). It is certain that these Yayoi were genetically similar to Koreanic peoples because genetics are a function of geographical distance. However the Jomon speaking tribes in Japan were Paleolithic peoples unrelated to the Neolithic Yayoi invaders. The Koreans are the most homogeneous ethnic group in East Asia. The Japanese are heterogeneous since they mixed with the Jomon Aboriginies and the Chinese are mixed with Southeast Asians. The Han commandaries were limited in both linguistic and genetic influence. They were destroyed by the Koguryo forces later at about 300AD. The Korean peninsula was genetically and linguistically pure compared to China and the Japanese archipelago. The Yayoi proto-Japanese mixed heavily with the archaic Jomon to form the modern Japanese population. The Baekje, Koguryo and Silla languages were all mutually intelligible and all of them were from the Gojoseon, the first Korean kingdom. None of them were Japonic. Proto-Japonic were derived from a Koreanic group from Southwest Korea (Baekje) and most likely spoke a dialect of Baekje. It's no surprise that modern Japanese are genetically closest to Jeju and Jeolla Koreans. They are the Neolithic Yayoi (continental Northeast Asian) relatives of Japanese. The other relatives of Japanese are the Paleolithic Jomon (non-continental archaic). Again genetics do not lie. Japanese are obviously mixed with continental East Asians and paleolithic archaic islanders who came via the southern route to Japan. Any modern geneticist will agree with me. Again it's hilarious how Lathdrinor thinks that linguistics and genetics are the same thing. Even if there were proto-Japonic groups in Korea, they were most likely genetically very related to neighboring Koreanic groups. Why? Because genetics is a function of geographical distance, especially when Neolithic population are studied. As another example it's not surprising that many Chinese are genetically close to Vietnamese and Thais since they are geographically close. Do they speak the same language? No. Are they genetically quite close? Yes. It's clear Lathdrinor either has very poor logic or doesn't know anything about recent genetic studies. Justin is plainly wrong in most of what he says. Japanese as a language cannot be said to have derived from Korean. This situation is different from genetics where the immigrant portion(Yayoi and the later arrivals) of the Japanese genetics is largely a subset of Korean genetic variation. For instance English is not derived from German, ie High German, the official language of FRG. But English is a Germanic language and has a common ancestor with High German at some point in the past. Even if one takes the view that Korean and Japanese are genetically(linguistic sense) related languages they are simply sister languages, neither derives from the other. And it is questionable that the two languages are genetically related at all to begin with. If Korean was not a single language but a diverse set of closely related languages and Japanese belongs to that group then you may say Japanese is derived from Koreanic. But that is not the case. Not even close. What you say makes sense only if Japanese was formed as some kind of creole but there is no evidence for it so far(though I know a few linguists who proposed it). I think everyone got your point (and I am sure it is wrong) and you don't need to repeat it over and over again. @Hector You have a remarkable capacity for misinforming yourself. The argument was not about genetics - it was about the derivation of one ethnic group from another. I spelled that out for you when I said that the common usage of the word "Korean" is as an ethnic, cultural, political, and linguistic identity. You then backtracked to say that everyone understood that what you meant by "Korean" was people from the Korean peninsula - which is where the argument should have ended, except that you felt compelled to argue that the Japonic Yayoi were not only people from the Korean peninsula but were ethnic Koreans. Your example of Irish Anglicization is, for once, appropriate - except for the period of time you choose to focus on and the conclusion that you draw from it. Although the Irish never abandoned their native language, the process by which they began to adopt English was effected the arrival of English elites and colonists - who were ethnically not Irish. The 19th century Anglicization period that you speak of was only a late stage of this process, and even then it was caused by the political and cultural influence of the ethnically separate English, who at the time governed Ireland against the will of its emergent nationalism. The appropriate period of comparison to Korea is, ironically, Japanese rule during the early 20th century, when Koreans were being coerced into speaking Japanese by Imperial Japan. In both the Korean and Irish case, the natives and the group whose language the natives were switching to were ethnically different - as it logically was during the Koreanization of early Korea. No, adopting another group's language does not make you ethnically distinct from those who haven't adopted it. But the group from which you adopted that language is, by definition, not the group whose language you used to speak. It is intellectually dishonest to bring up the Anglicization of the Irish and to focus solely on the Irish who adopted English, and not on the English whose language they were adopting. As for the rest of your comment, it sounds as though you have nothing else to offer. Archaeological items are rarely sufficient for determining linguistic and ethnic identity, and burial practices are conservative only relative to other rituals. They are all subject to periodic change and influence - especially religious influence - as the various historical changes to the region's burial practices - including the beginning, spread, and end of dolmen construction demonstrate, unless you naively believe that the spread of dolmen construction was strictly demic expansion. "According to Vovin certain Korean loan words appear in Old Western Japanese because "Japan was a country founded by Koreans"." A special place in academic hell is reserved for people who misquote their sources. I did a text search through Vovin's papers and Koreo-Japonica and found no matches with this quote. Do not use quotes when you don't plan on quoting them accurately. "Oh yeah I forgot to mention how massive was the Korean immigration (Korean speaking bona fide Koreans in any sense of that word) during and right after the Three Kingdom period. But you know... I am not that cruel"
I'm glad you're starting to appreciate the difference between bona fide Koreans and the Yayoi immigrants who became the first bona fide Japanese. Of course, latter day Korean immigrants to Japan did contribute to the Japanese population and were assimilated within it. No group is pure. @Justin the presumption by Korean scholars that the Korean peninsula has been homogeneous since primordial times is a construct of modern political nationalism, nothing more. The development of the Dangun myth, and its attendant state Gojoseon, is an academically studied phenomenon that you ought to benefit from educating yourself with. That is what I leave you with, because frankly debate is worthless when all you do is repeat the same tired refrain whatever I say. I never had a high opinion of Lathdrinor but this is a bit too much. LOL. If I used the term "derived" in the context of and in reference to a paper trying to determine the genetic composition of modern Japanese... it should be obvious to everyone what it means ... except Lathdrinor apparently. And then he preemptively accuses me of all those things that the rest of the readers of this blog clearly see from him instead. And I don't think he has all of Vovin's publications in pdf but if he does I suggest he try harder. If I go through the pain of finding the passage for him he will most likely quibble about some meaningless details as he always does. Lathdrinor fits the usual profile of Japanese "internet-ultra-right-wing". If he intends to be seen as a "neutral party who just happens to love Japan and hate Korean revisionism", I just don't buy it. And nobody should. Oh Chinese are not a third party as they hate being left out in accordance to their fantasy that they "fathered everyone in East Asia" and I don't rule out Lathdrinor's being one of them. To moderators: it is Lathdrinor who accused me of being a Korean nationalist first and you did not filter it out. I guess it is only fair that I make a guess as to who he is even if it is not directly relevant to this discussion. My previous post already appeared so maybe this is not a double post? I hope mods be lenient here. It is not really difficult to find the passage. "... it only for deities and members of the elite. This can be expected, since the Japanese nation was essentially founded by people from the Korean peninsula." I usually get a full page from google books but it fails to load right now. As I recall it is in reference to certain Korean loan word in Japanese(Old Western Japanese I think) that refers to a common person in Korean but to "deities and members of the elite" in Japanese. His quibbling about the distinction between "Koreans" and "people of Korean peninsula" is expected but I am not sure how he can reconcile it with his mindless identification of language and ethnicity since, after all, it is about a Korean loan word in Japanese, which means those who "founded" were speaking Korean. And yes it is about statecraft and building a nation than about ethnic origin, but I never meant otherwise. And in a way this galls Japanese nationalists even more. No I don't expect Lathdrinor to apologize. Actually I like him that way because it is compatible with my fantasy of how Japanese ultra right wings behave. He has a caricaturistic comic value that way. ... And his corny pontification against Korean nationalism adds to that value. Tangun Myth is not a modern construct. Lathdrinor was simply groping for spiffy sounding words to cover up his inadequacies. Even under the most cynical interpretation Tangun myth dates back at least to the 13th Century. As for Old Jhoseon in general... it is even in Chinese records. Perhaps 2333BC is a figure hard to justify but certainly very very old. Lathdrinor is quite tantalizing. He makes me come back again and again by presenting his weak "arguments". But I REALLY should stop here. Both of you have displayed little knowledge about genetics. Please refer studies by the HUGO Pan-Asian Consortium, such as Identification of Close Relatives by the HUGO Pan-Asian Consortium. That study has an excellent genetic map showing the genetic relationships of East Asians, including various South and Southeast Asian ethnic groups. All recent genetic studies confirm that the Chinese and Japanese are the most mixed. Japanese also have very mixed dental types among their population. Some are more Sundadont (Australoid) than others. This is due to the Jomon influence. The Jomon are part of the proto-Australoid race who migrated via the great coastal migration route to Japan earlier than the Neolothic Yayoi invaders. The Koreans are pure Northeast Asians with all their genetic components being continental East/Northeast Asian. The Japanese are like Koreans with more Jomon/Australoid components (some ADMIXTURE runs consistently identify 3% to 8% Papuan or Melanesian admixture among Japanese wheres Chinese and other continental East Asians have 0%). Therefore this Papuan/Melanesian (Australoid) component among Japanese is not "noise". Chinese are basically mixed with continental East/Northeast Asian but with more Austronesian/Southeast Asian components. So these genetic studies show Koreans are a homogeneous race, whereas Chinese and Japanese are mixed with Australoid-like populations and Austronesians. I highly suggest that you read up on more recent genetic studies before fooling and humiliating yourself. Unfortunately, I was not able to respond in a timely manner because of a business trip. Nonetheless, I detect that the discussion is at an end because the parties involved are no longer willing to formulate informed arguments. @Hector it's funny that, having ran out of arguments, you resort to the good old Japanese right-wing attack. While I have accused you of holding Korean nationalist ideas - because they are blatantly obvious - I have always addressed the arguments you raised. Your last comments, however, are not even worth responding to for what little they contain. For your information, a linguist like Vovin would not use *people from the Korean peninsula* when he means *people who spoke Old Koreanic*. The choice of words is deliberate, but you are not willing or able to see that. In this, your ability to misinterpret and distort your sources is, as I said, remarkable, and your fallback on diversionary tactics and ad hominem tells me that you lack the insight for further debate. If it was the case that you had no illusions about what I meant by Koreans and what you meant by Koreans, then this banter has been useless from the start. Your persistence in the attempt to argue that populations from the Korean peninsula = ethnically Korean, however, says differently about what you meant versus what you professed you meant, which adds deception to the list of rhetorical devices you've chosen to use in this debate. @Justin you accuse others of having no knowledge of genetics, yet you are ignorant of the basics. Koreans are not a race. Northeast Asians are not a race. Koreans are also not unmixed. Haplogroup studies have shown that long ago, and the Hugo Pan-Asian studies in no way refute this. What you are correct about is that Koreans are a relatively uniform population - that a Korean selected at random is closer to another Korean selected at random than is observed in Chinese and Japanese. This is because the geographic isolation of the Korean peninsula have resulted in a genetic leveling effect, which overtime makes a population uniform. These are the basics. Lathdrinor you are ignorant of the definition of race. Race is a classification system used to categorize humans into large and distinct populations or groups by heritable phenotypic characteristics, geographic ancestry, physical appearance, and ethnicity. Race does not have to mean Mongoloid, Caucasoid or Negroid. That's just one theory of classifying race. You are also ignorant of the basics of genetics. Genetics are a function of geographical distance. It is certain that populations in the Korean peninsula before Japonic languages were spoken were genetically similar. And the immigrants from the Korean peninsula who went to Japan were most likely genetically similar to neighboring populations. Christopher I. Beckwith, Empires of the Silk Road: A History of Central Eurasia from the Bronze Age to the Present (Princeton University Press, 2009). Beckwith found that the toponyms in Japan is most similar to toponyms in southern Korea (or what used to be Gaya). So Beckwith does not support your assertions that there were a Japonic speaking population in Korea, he merely stated that the Gaya may have spoken a language which gave rise to a language which was then spoken in Japan. However, genetically, Japanese are closest to Southwest Koreans (Baekje) which in Korea is called the Jeolla region. Linguistically, the Japanese language is most similar to the Gaya language (a Koreanic language spoken in the southern-most part of Korea). The Gaya language had dialects and one of them got transferred south to Japan, giving rise to proto-Japonic languages). Genetically Japanese people are most similar to Southwest Koreans (Baekje). "Race is a classification system used to categorize humans into *large* and *distinct* populations or groups by heritable phenotypic characteristics, geographic ancestry, physical appearance, and ethnicity." I emphasized the features that you managed to miss. Besides race being a concept that few anthropologists and geneticists are willing to talk about today, there is nothing in the definition that supports you. Koreans are not a large and distinct human group, not by the definitions of the pre-modern physical anthropologists who defined race, and not by geneticists today. You can define race as whatever you want, but don't expect others to accept your definitions. "You are also ignorant of the basics of genetics. Genetics are a function of geographical distance. It is certain that populations in the Korean peninsula before Japonic languages were spoken were genetically similar. And the immigrants from the Korean peninsula who went to Japan were most likely genetically similar to neighboring populations." Genetics isn't just a function of geographical distance - it is also a function of language. Both are relevant features, and I never said that the immigrants to Japan were not genetically similar to neighboring populations. "Beckwith found that the toponyms in Japan is most similar to toponyms in southern Korea (or what used to be Gaya). So Beckwith does not support your assertions that there were a Japonic speaking population in Korea, he merely stated that the Gaya may have spoken a language which gave rise to a language which was then spoken in Japan." "Japanese and Korean are undoubtedly not related by divergence and it is obvious that no genetic relationship ever existed between the two languages." "The archaeological, historical, and linguistic evidence agrees. The Koguryo people brought their language to southern Manchuria and the Korean Peninsula and conquered the local peoples, who were kept in a subservient position ... The Japanese-Koguryoic speaking ancestors of the founders of the Koguryo kingdom lived in Liaoxi, as did their relatives the Wa, but the Koguryo and the Maek, Puyo, Okcho, Ye, and Puyo-Paekche gradually migrated eastward by land into southern Manchuria and northern Korea. By the end of the fourth century they had overrun the Korean Peninsula, most of which was occupied by [Samhan] peoples (some of whom undoubtedly spoke Proto-Korean) and by Chinese. The Puyo-Kuguryoic peoples borrowed some words from the local peoples, but in Koguryo territory, at least, they evidently continued speaking Koguryo until their kingdom was destroyed in the seventh century. The Koguryo ended up contributing their name, Koguryo ~ Koryo, ie 'Korea', to the country and the peninsula, and some loanwords to the local languages, including Pre-Old Korean and Old Korean, before their own language became extinct. Although Koguryo had a great impact on Korean, particularly through its contribution of numerous loanwords, 'Korean' is the language of Korea today." In other words, Beckwith argued that local Koreanic and Chinese speakers in the Korean Peninsula were conquered by Japonic speakers, who bestowed their country's name upon the natives - thereby giving rise to the term Korea - but whose language was preserved only by the Japanese, though Korean loaned a great amount of words from it. Once this all sinks in, you will see why Hector so vehemently attacks Beckwith, and perhaps you will do the same. It is also why I did not bring up Beckwith at all - for the purpose of what I'm arguing, his extremist position is not conducive and distracting. "Race is a classification system used to categorize humans into large and distinct populations or groups by heritable phenotypic characteristics, geographic ancestry, physical appearance, and ethnicity." Basically race can be classified in terms of phenotype (looks), geographic ancestry and ethnicity. Therefore Korean can be a race if race is defined in the context of ethnic groups. There is a much stronger correlation to genetics with geographical distance than with language. For example, adopting a European language (e.g. French) by a person of Sub-Saharan African descent does not make him genetically French. Empires of the Silk Road: A History of Central Eurasia from the Bronze Age to the Present (Princeton University Press, 2009). Rather than there being a real Koguryo-Japanese linguistic relationship, he states that there is rather a Gaya-Japanese relationship. So it is YOU who has to read up more on Beckwith's literature. It is highly unlikely that the Koguryo or proto-Koguryo (northern Koreanic-speaking peoples) migrated to Japan. Baekje, Koguryo and Buyeo are in the same linguistic family, however not genetically the same, but similar. Koguryo, Baekje and Silla were all Koreanic. Vovin and Unger both claim that Koguryo is classified as Old Korean, which is 100% Koreanic. It is widely believed by linguists such as Beckwith, Vovin and Unger that the Koguryo and Baekje languages were identical, since Baekje was founded by a cousin of the king of Koguryo. Beckwith believes that the Samhan people were proto-Japonic speaking people who were absorbed by the Buyeo and Silla-speaking Koreanic people from the north. Silla was also part of the northern relatives, since Silla was also from the Gojoseon, just like Buyeo and its offshoots - Koguryo and Baekje. Furthermore, the Gaya was thought to be the only state which was purely Samhan and this is the group which Beckwith believes are the ancestors of the Japanese. Whether they spoke proto-Japonic or Koreanic is still yet to be proven, however Beckwith believes that it was the most related to Japonic. Lastly, Beckwith never suggests that Korea was over-run by Koguryo, but rather, the three Korean kingdoms were genetically and linguistically related. He also never suggests that the Koguryo belongs to the Japonic language family, but rather, he suggests that the Japanese language belongs to the Buyeo language family (of which Koguryo and Baekje also belongs to according to his hypothesis). Before mis-interpreting Beckwith again, I highly suggest you read his new book: Empires of the Silk Road: A History of Central Eurasia from the Bronze Age to the Present (Princeton University Press, 2009) p98-120. Again, it's funny how you assume and mis-interpret Beckwith in such a way to fit your theory that Koguryo was Japonic. Koguryo was Koreanic and that is supported by Beckwith, Vovin and Unger. However Beckwith has his own little hypothesis that maybe Japanese was a part of the Buyeo language family (of which Koguryo and Baekje were also a part of). However in 2009 he changed his stance and says that the most likely linguistic relatives of the Japanese are the Gaya, which was a confederacy made up of Samhan people in southern-most Korea before they expanded further south to Japan. I think this fits genetic, linguistic and geographic evidence and the most plausible theory and Beckwith finally sounds more realistic. "having ran out"...? This is not a grammar attack; since Lathdrinor keeps silent about his ethnicity I am free to make an educated guess. This is a very typical Chinese ESL pattern. Perhaps Taiwanese for his pro-Japanese anti-Korean stance. So I did not err too much. There is an almost identical passage in "A Descriptive and Comparative Grammar of ...". "This conclusion can be further supported by the fact that MK -tolh is a neutral marker of plurality, while Old Japanese -tati significantly narrowed its meaning referring only to deities and members of the elite that can naturally be expected in this case, since the Japanese state was essentially founded by people from the Korean peninsula." As I said previously "founding" was in reference to the state formation than about the ethnic origin and as I said I have a feeling that this is more annoying to Japanese and their Taiwanese followers. And isn't it obvious that the "people from the Korean peninsula" in this case actually spoke Old Korean? at least in Vovin's mind? Vovin did not use the term "Koreans" because he did not want to simplistically equate language and ethnicity, which by the way Lathdrinor is doing precisely. I don't envy Lathdrinor's position. On one hand he wants to argue that Para-Japonic speakers of ancient Korea were more akin to Japanese than Koreans because of the language, but the "people from the Korean peninsula" in Vovin's passage were not akin to Koreans even though they spoke a form of Old Korean. Make up your mind, Lath. It is not the end of the world even if Chinese had very little input in the genesis of Japanese people. Did you really believe in such fantastic tales like those of Chinese sailors losing their way to Japan and founding the nation by mating with Japanese aboriginal women who found them "handsome"? It may hurt for a little while but just get over it. "It is undoubtedly true that the dynamic new nation-building dynasty [of Japan] was founded by warriors-returning Japanese-who had adopted the Central Eurasian Culture Complex in the Korean Peninsula. The lack of any support for the ethnic Korean conquest theories contrasts with the substantial support ... for such a "conquest" of Japan by Central Eurasianized Japanese. See Beckwith (2007a)." Beckwith shamelessly quotes his 2007 book on this matter. How do you read him as having amended his ways? "Beckwith believes that the Samhan people were proto-Japonic speaking people who were absorbed by the Buyeo and Silla-speaking Koreanic people from the north." How exactly do you get this from, and I quote Beckwith: "another Puyo-Koguryo clan established a dynasty in the new Silla Kingdom in the area of the former Chin Han realm in the southeasternmost corner of Korea, though the kingdom *remained* Korean-speaking." Do you understand why the word remained is here, in this context? "Lastly, Beckwith never suggests that Korea was over-run by Koguryo, but rather, the three Korean kingdoms were genetically and linguistically related. " From Beckwith: "In the fourth century the Koguryo finally captured Lolang. [They] moved their capital there and, along with other Puyo-Koguryoic people, proceeded to *overrun* most of the Korean Peninsula. The Kingdom of Paekche was established by the Puyo clan in the area of the former Ma Han realm in southwestern Korea, while another Puyo-Koguryo clan established a dynasty in the new Silla Kingdom..." Beckwith states in the same book that Puyo-Koguryo was located in southern Manchuria before their migration to Korea in the 4th century. "However in 2009 he changed his stance and says that the most likely linguistic relatives of the Japanese are the Gaya, which was a confederacy made up of Samhan people in southern-most Korea before they expanded further south to Japan. I think this fits genetic, linguistic and geographic evidence and the most plausible theory and Beckwith finally sounds more realistic." That's not Beckwith's idea, it's Unger's. But I'm glad you're able to come to terms with Japonic speakers being present on the Korean peninsula. That's progress. The rest are details I don't care to argue - these comments have ran for far too long. "And isn't it obvious that the "people from the Korean peninsula" in this case actually spoke Old Korean? at least in Vovin's mind?" If Vovin meant people who spoke Old Korean, he'd have said it here or, failing that, elsewhere. The idea that the elites who founded Japan were Old Korean speakers is a radical assumption - to assume it brings forth a host of other assumptions that have to be validated. Vovin, judging by his meticulous navigation around the issue, has no set stance. Whenever he brings up the question of when the linguistic loan from Old Korean to Old Japonic occurred, he qualifies it with a *perhaps on the Korean peninsula*, which leaves the linguistic identity of the Yayoi elites undetermined. Unger, Janhunen, and Robbeets are, however, quite explicit in their stances on this. I fail to see why you focus only on Vovin's ambiguity. As for the rest of your post: amusingly irrelevant, but given that I guessed your disposition in the very first response while you failed to guess mine even now, I wouldn't put too much stake in that clairvoyance, Hector. Actually Vovin explicitly claims that most of Korean loan words in Japanese were borrowed from "the 4th to 8th Century" i.e. post Yayoi migration. This is precisely the period during which the influence from Paekje was the greatest, and this is the basis on which he rejects the genetic relationship between Korean and Japanese. In fact this is also one of the reasons he rejects the idea that the language of Paekje elites was Japonic. Most of Korean loans in Japanese are attested in Western Old Japanese first indicating that those were loans, not cognate words, which Vovin particularly emphasizes. The rest of the loans are deemed to have occurred on the Korean peninsula and this is indicated by the fact it has no regional specificity within Japonic. Vovin also thinks that Korean has a Japonic substratum which almost looks like loans from Japonic to Korean purely from a linguistic point of view. However he makes notes on the nature of these loans. Korean loan words in Japanese tend to represent high culture or be of military nature. In linguistics there is a fairly well established phenomenon where the nature of loan words represents the socio-political nature of the participants. A much milder form of this exists between Korean and Chinese, also English and Latin where the loans from "the higher culture" maintain the higher status. However unlike Korean and Chinese these loans are deemed to reflect the actual demography of the founders of the state because they are so extensive and due to the nature of what these loans represent as Vovin repeatedly makes note of it. That is the context in which Vovin said these things(and he was even more explict in his interview with a Korean journalist). This is about all I need to say;this stuff ran its course and I am not interested in further conversing with someone whose ego is bleeding to death because his racist view of the world is threatened by scientific and historic facts. I can never understand these Taiwanes boys. For all their huff and puff and pontifications against evil Koreans, Koreans themselves cannot care less about Taiwan. Many even think Taiwan is the same as Thailand. "another Puyo-Koguryo clan established a dynasty in the new Silla Kingdom in the area of the former Chin Han realm in the southeasternmost corner of Korea, though the kingdom *remained* Korean-speaking." This suggests that the founders of Silla were Puyo-Koguryo. It doesn't suggest anything about Gaya. Gaya was mostly made up of Samhan people. It is thought to be the only state which was purely Samhan. Ask any historian who specializes in East Asian or Korean history. It's well documented that the invaders from the north (Buyeo and Silla - both Gojoseon offshoots) conquered and absorbed the Samhan. Baekje absorbed Mahan and Silla absorbed Jinhan. However there was another Samhan state called Byeonhan which became Gaya and Gaya was the only purely Samhan state. Since Gaya was purely Samhan, it is correct to say that the proto-Japonic speaking people were Samhan. Beckwith's toponymic data on Japanese suggests that Japonic is most related to the Gaya language, not Koguryo or Buyeo. This suggests that the Gaya language was rather more related to proto-Japonic and is generally not classified as part of the Buyeo or Silla languages. Vovin and Unger both suggest that Koguryo, Baekje and Silla both spoke mutually intelligible languages and classify all three languages as Old Korean and thus Koreanic. The more you read Vovin and Unger's literature, the more frustrated you will become because they completely say the opposite of what you are suggesting. Again, I suggest you read Beckwith's new book (2009) rather than reading his illogical, fantasy book. Furthermore, genetic studies have suggested that Japanese males have mostly Y-DNA haplogroup O3 and O2b1a (Yayoi invaders) and D2 (Jomon Aboriginals). Haplogroup D is otherwise most frequency in the Himalayas, Southwestern China and the Andaman Islands. Interestingly there is also a sporadic appearance of Y-DNA haplogroup C1, which only occurs in Japan (possibly of Jomon origin). Koreans have mostly O3 and O2b* and O2b1, which confirms that the continental relatives of the Japanese were related to the Koreans of today. Interestingly, the frequency of the O2b1 subclade peaks in southern Korea, whereas O2b* is found in central Korea and populations of Manchuria (including samples of Xibe, Manchus, Nanai, Evenks and various Mongolian ethnic groups. O2b1 is a descendant of O2b*, hence it is clear that the Japanese were founded by invaders from Korea. 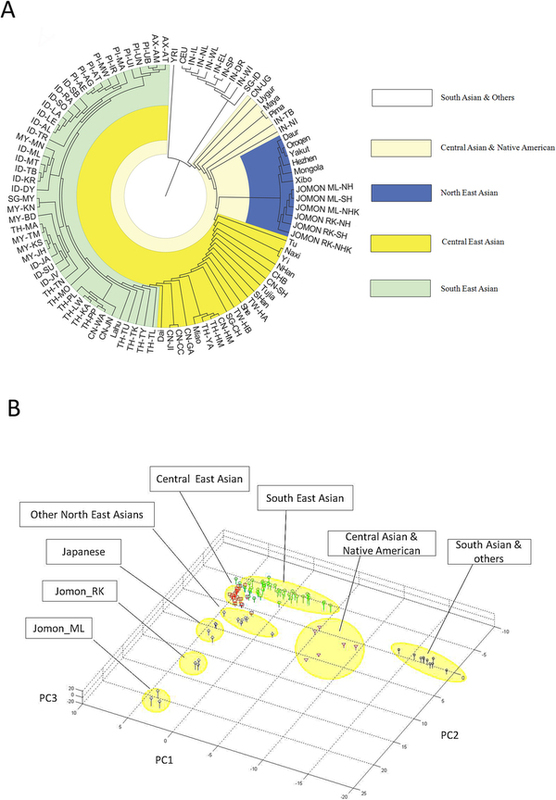 A recent HUGO study suggests that the Japanese mostly cluster with the Koreans, however shift towards South Asians on the PCA, indicating a closer Japanese-South Asian relationship. This closer relationship to South Asians is from Jomon admixture, the paleolithic ancestors of the Japanese. @Hector "However unlike Korean and Chinese these loans are deemed to reflect the actual demography of the founders of the state because they are so extensive and due to the nature of what these loans represent as Vovin repeatedly makes note of it." They are deemed to reflect the actual demography of the founders of the state by whom? Vovin? No - because he never makes the assertion. This is a classic case of your habit of conflating your own opinions with those of the sources that you cite. Systematic borrowings from Latin, particularly in the vocabularies of high culture, exist in the bulk of Western European languages, yet few were founded by Latin speakers. To proceed as you do towards the demography of the Yamato rulers is to put the cart before the horse - Vovin knows better. Indeed, both of the examples you gave describe military technologies - a component of culture subject to rapid dispersal, as indicated by the spread of metallurgy, for example, which was attended by direct linguistic loans from the source metalworking cultures, but were not attended by demic change. As for the interview that you have failed to source and cite, let's say instead it's a rather conveient time for you to quit the conversation behind a string of childish racism accusations after race baiting for the better part of the last three weeks. On top of it, you've failed again at the ethnic guessing game. Your final paragraph is a wonderful microcosm for your entire approach to knowledge. @Justin when did this discussion become about the elite lingua-franca of Baekje, Silla, and Koguryo? Once again, you are mis-reading Beckwith if you think he's retracted what he said before, but I have no interest in pursuing that further because Beckwith was and is irrelevant to my argument. He entered the discussion strictly of your - and Hector's - accord. I am sufficiently satisfied that you now believe that Japonic speakers lived in the Korean peninsula and were distinct from Koreanic speakers - the original subject of contention. As for your genetic arguments, it stands to sense that haplogroups of the time depth you are talking about has little bearing on what happened ~2000-2500 years ago, and frankly speaking your genetic assignment of individual haplotypes to historical groups is amateurish and does not stand up to scrutiny. For example, there is no evidence whatsoever that the Yayoi immigrants were comprised solely of O2b descendants, and no evidence that the haplogroup itself decides either Japanese or Korean identity. To this end, no one is arguing against the notion that Japan was derived from populations in Korea, both Japonic and Koreanic, as well as other populations including the Jomon. What I'm arguing against is the conflation of that population with ethnonationalist concepts of Korean language and ethnicity. Insofar as we are able to understand and apply such concepts to ancient groups, Japanese records have never indicated that the ancient Japanese saw themselves as Koreans. That itself ought to be enough, but as these comments prove, it is not. Haplogroup O2b is a marker for ancient Koreanic people since it is most diverse in Korea. The fact that the O2b* subclade peaks in Korea and is the subclade of O2b which appears most frequently among populations of Manchuria and various Mongolic ethnic groups suggests that the Koguryo and Balhae (northern Koreanic people) had O2b*, but not O2b1. The O2b1 subclade peaks in southern Korea and Japan, suggesting that the continental relatives of the Japanese came from southern Korea. It is, however, disputable whether they were the only Yayoi people who migrated to Japan. There is archeological and genetic evidence that the southeastern Chinese also migrated to Japan. Proto-Japonic speaking people may or may not have existed in Korea. Beckwith suggests that the Gaya language is most related to Japonic, however there is still not enough evidence to suggest that the Gaya people spoke Japonic or Koreanic. Whether the invaders from Korea to Japan considered themselves to be Korean or Japanese can not be determined since the ethnogenesis of the Japanese are from the fusion of these immigrants with the Jomon. Japan as a national identity came much after the Yayoi period. I think this whole intra ethnic group identity argument is useless since there was no Korean or Japanese identity during these periods. If the proto-Japonic speaking people were from Gaya, as Beckwith suggested, they most likely viewed themselves as people of Gaya rather than non-Gaya. They certainly didn't think they were different from the Gaya people who stayed behind in Korea. The Gaya themselves were probably related to Baekje and Silla, since genetics is a function of geographical distance. In a modern context, I don't think Koreans view Japanese as descendants of Koreans. Nor do Japanese view themselves as such. It's surprising, however, that the Japanese emperor (Akihito) actually stated his kinship with the Koreans. It's good that we agree that the Koreans and Japanese view themselves as Koreans and Japanese, respectively. Korean nationalists seem to view Japanese as Koreans who became mongrels when they mixed with the Jomon Aboriginies, whereas Japanese nationalists claim that the Japanese are from Southeast Asia, not Korea. Both arguments are false and I think that both sides should become more mature when it comes to sensitive issues such as ethnogenesis and ethnic identity. Korean nationalists seem to view Japanese as Koreans who became mongrels when they mixed with the Jomon Aboriginies, whereas Japanese nationalists claim that the Japanese are from Southeast Asia, not Korea. Both arguments are false and I think that both sides should become more mature when it comes to sensitive issues such as ethnogenesis and ethnic identity. In a purely genetic sense (excluding languages and "ethnic" identities) the former is true, while the latter is completely false in all senses. Lathdrinor cracks me up everytime. This is not a cliche internet flame; he really does. To be honest, his English sounds fine other than typical ESL errors here and there, and I really have to wonder whether he is pretending to not understand what is so evident to everyone. 1 -tati is a loan from Old Korean. 2 Old Korean in Vovin's vocab is from 300 AD to about 10th Century. 3 This loan was the result of the founding of Japan by people from the Korean peninsula. 4 Yayoi period is over by 300 AD. Then the above chronology necessitates that the founders of Japan borrowed a word from people who lived across the channel... for no apparent reason other than that Koreans lived near their homeland. If the word was borrowed while the Japanese founders still lived on the Korean peninsula that would not be Old Korean but Ancient Korean or Proto Korean in Vovin's vocab. I doubt Lathdrinor understands this argument but that is precisely the comic effect I am trying to educe here. Hilarious. This may be too cruel but I will leave with Vovin's recent lecture. "The etymologies I am going to present have important implications for the uncovering of the true role or Koreans in the early Japanese history: in my opinion they strongly suggest that at least some of the ‘dynasties’ that ruled Yamatö could be of a Korean provenance." Does anyone have any doubt whatsoever about what Vovin meant by "people from the Korean peninsula"? hmmm? I encourage Lath to cry hard, really hard as any Japan-loving Taiwanese should. Crying is good for your health and for the love of Japan... DO IT. This ungrammatical use of a nominal modifier strongly suggests that the speaker is Chinese or maybe Japanese. No chance whatsoever that he is from Europe. "The above illustration shows the ancient minister Takeuchi no Sukune holding the future emperor Ōjin as a baby in his arms. Did he sing a Korean lullaby then? " You are speaking as if all Europeans are proficient in English. I am not sure that my last comment got through. The discussion has ran its course and I do not begrudge the mods for no longer approving comments. Nonetheless, just in case it was an error on my end that the comment did not go through, I will make a final response. @Hector your constant flame baiting in the comments and your fixation on Vovin to the exclusion of other scholars notwithstanding, I am glad that you have provided the minimum reference to support your beliefs about Vovin. However, I still do not agree with your assessment that he is talking about ethnic Koreans or Koreanic speakers when he says "people from the Korean peninsula." The cause is simple - in the 2012 lecture you linked, Vovin talks about the role of Koreans in early Japanese history, arguing that several of the Yamato dynasties were "possibly founded by people of Korean provenance." Regardless of whether you buy this argument - personally, there are a lot of problems with using names to determine ethnic and linguistic affinity, particularly in the Korean case - what it indicates is that Vovin delineates a distinct boundary between those of Korean provenance and those who were Japanese. That is to say, while to Vovin several of the Yamato rulers may well have been of Korean provenance, by arguing such he is distinguishing these cases from the Japanese. This requires the existence of Japanese identity by the period he is talking about, which quite logically says that Japan existed before Yamato. To this end, Vovin's beliefs about Jingu and Ojin being of Korean provenance were obvious even in Koreao-Japonica, yet he went ahead and made the distinction between Koreans and people from the Korean peninsula. This is why his stace is ambiguous - though he believes that certain Yamato rulers were the descendants of Koreans, he never made that case for Japan and Japanese in general. Consequently, a plea of semantic equivalence is not helpful here. Vovin knew what to write when arguing that particular persons were Korean descendants. He did not write this way when talking about the people who founded Japan, preferring instead to use the neutral phrase "people from the Korean peninsula." I offer that this is intentional, but it's an unresolvable question without inquiring Vovin himself.